That root of bitterness keeps them apart until a letter from Keith’s grandmother, Ruth, draws Naomi to Londonderry to find she’s too late. Ruth has passed on. After the death of his beloved grandmother, Keith has also come to Londonderry only to open the door to his past…Naomi…beautiful as ever, the girl who broke his heart. 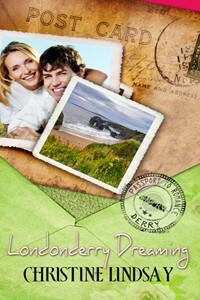 When I saw the submission call on Pelican Book Group for a new line of books called Passport to Romance I got excited. I was born in N. Ireland and wanted to be the author to write the story they were requesting set in the Irish city of Londonderry. I had been to Londonderry and was fascinated by their medieval stone walls, and of course by my own Irish ancestry. Many of the conversations in the book, the humorous ones especially between the two Irish cousins (secondary characters) were taken directly from real-life dialogue. I figured if my Irish cousins had me laughing, their turns of phrase would make my readers laugh too. I also wrote the setting of the book (especially the romantic scene) on the majestic coastline of N. Ireland, in a famous spot called The Giant’s Causeway. I wanted my readers to see a little of the beautiful country I was born in. The British Empire is coming to an end with the Partition of India. As millions flee to the roads, caught up in the turbulent wake is Captain Cam Fraser, his sister Miriam, and the beautiful Indian Dassah. Cam has never been able to put Dassah from his mind, ever since the days when he played with the orphans at the mission as a boy. But a British officer and the aide to the last viceroy cannot marry a poor Indian woman, can he? The 1947 Partition of India has separated the country these three love…but can they find their true homes before it separates them forever? After my debut novel Shadowed in Silk was published in 2009, and won several literary awards, I had to decide either to write another book with a setting more marketable for the US audience, or stay true to my artistic self. I chose to believe in my story. I wrote Captured by Moonlight book 2 of the series which also won a few literary awards. 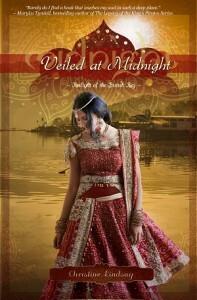 Veiled at Midnight is the finale to that trilogy. I’m extremely proud of this 3-book series. While it has garnered significant literary accolades, its setting seems to be passed over when readers are glancing through book lists. But when readers do pick it up and read it, they often write to me and tell me how refreshing it was for Christian fiction, and how much they loved it. My readers fell in love with my characters from book 1, and seeing the various members of that group tell their own stories in each book has been fulfilling. Veiled at Midnight is special to me though, in that I was able to tie up all loose ends and bring the story to its final and satisfying close at the end of the Partition of India when the country of Pakistan was created, and when the British Empire came to an end. I was inspired to write this series when I heard about the persecution of Christians in Iran about five years ago. Because I’ve always been an avid reader of mysteries and thrillers, I knew my first book would be in this genre, and that’s when I asked the questions that became the plot line of One Night in Tehran. I wondered what would happen if a veteran CIA intelligence operative in Tehran encountered a group of Iranian Christians and became a believer? How would his conversion affect his career? How would a man trained to lie and deceive others be able to follow the teachings of Christ in the real world? At thirty-nine years of age, Will Gailey is an “over the hill” singer-songwriter who leads a rock band that the music business doesn’t consider to have the “now” sound. A trauma has rocked his world, and as a result his memory of events has been severely affected. Will can remember the lyrics and chord changes to his songs, but there are other things that seemingly he’s forgotten. Will has always enjoyed fishing, but even that relaxing activity has become a source of frustration. He’s become angry and disassociated, and has turned from the one thing that could bring him peace and healing. And where that one thing is concerned, that’s where his anger and the blame for his physical and spiritual pain are errantly directed. In his mind, that one thing is the cause for his loss and his suffering. Months after the trauma, Will continues to suffer crushing headaches. He decides to take matters into his own hands as what is supposed to heal his anguish is only exacerbating it. He’s become weakened, vulnerable, and open to spiritual torment. He’s alone and in need of help, but when people come into his life that can be of assistance he’s apt to reject them. Vivid dreams, visions, and hallucinations occur, and in them are both the help he needs and likewise persecution. Will was a strong man, but now there’s a strong man that’s found a breach and is creating havoc in his life. Will remembers how to defeat the strong man, but it seems that he’s chosen to forget. Will has changed, but band mates and friends remember how he “used to be.” Can he be the way he used to be again? I have to admit that the inspiration for Remembering Will came out of the blue. My previous works have all been related to the biblical end of days, but as I was driving on snow-covered roads in the record-breaking cold of February 2015, I thought of warm weather and fishing. Then, as a musician myself, I began to think about struggling musicians that would be considered over the hill by music business standards. The two themes of music and fishing merged together in my mind. From that, I thought of a character named Will who is a musician that enjoys fishing. His troubles and torments grew out of that as I drove, and the ideas of trauma and memory loss came from there. I thought about pain and medication and likewise the loss of faith and hope. This poor guy Will, what would happen to him? What would cause his physical pain and spiritual and mental torments? I had to get home and start writing! I have to admit that the story ripped me up as I began to put it together. THE FIRST 9/11 was so shocking it was covered up for over a hundred years. Even more amazing, the true story of the first act of religious terrorism in the United States took place on Sept. 11, 1865, an eerily significant date. The massacre was ordered by the Mormon Church, which they deny, or at least executed by devout Mormons in Southern Utah who believed they were carrying out the orders of their Prophet Brigham Young. Out of his own mouth, from sermons taken from historical documents, Joseph Smith, the founder of the LDS Church, admired Mohammed. The seeds of violence began because of vicious attacks against the Mormon Church in Missouri. SEPTEMBER DAWN weaves in a fictitious love story between two teenagers, Emily, the daughter of a Christian pastor, and Jonathan, the son of a Mormon Bishop who fall in love amidst the tragic, historical story of one of the biggest massacre in the United States. As a side note, there were arguably seven massacres in Utah and Idaho. Three Presidents, Lincoln, Buchanan, and Pierce tried to stop the slaughter of wagon trains traveling through Utah and Idaho to the California Gold Rush and government officials. Historical and Congressional records of speeches remain as indisputable truth that this is fact, not fiction. Despite the fear and hatred surrounding the young lovers, they choose to put aside their differences. Forced to choose between his brother, his family, and his faith, or his beloved Emily, Jonathan is faced with a decision that will haunt him for the rest of his life. The story of the Mountain Meadow Massacre is a cautionary tale of violence and religious prejudice. Blame can be found on both sides but in the end, it is far better to remember history, not to point fingers, but in order that we not repeat it. Based on the motion picture “September Dawn,” starring Jon Voight, also written by screenwriter/author, C.W. Schutter. On the hunt for an assassin, Titus Ray faces a threat he never imagined. Can he overcome the obstacles and capture Ahmed Al-Amin before it’s too late? The hunt for Ahmed Al-Amin continues in Book 2 of the Titus Ray Thriller novels, a series of fast-paced adventures full of intrigue, romance, and suspense. What’s a girl to do when a five foot eight, hazel eyed import from LA shows up at school one day? What else, but fall head over heels in love! That’s exactly what happens when Lukas McGhee strolls into Sharlee’s high school in the suburbs of Atlanta. All the girls want him, but to Sharlee’s surprise he asks her to the Homecoming Dance. But Lukas will have to get the approval of Sharlee’s sho’ nuf sanctified grandma before he takes Momma Johnson’s baby girl anywhere. Somehow he survives the hand wringing interrogation, but not before Momma Johnson makes it perfectly clear that Sharlee is a Christian girl and better stay that way. Easier said than done. Sharlee finds herself in some pretty sticky situations that put her faith and will power to the test. Will calling on Jesus, a praying best friend and a Bible App get her through prom night and a weekend rendezvous? Find out, in Whose Am I? When a deserted real estate agent tries to flip a Texas horse ranch she gets a second chance at love. When a deserted real estate agent tries to flip a Texas horse ranch she got in her divorce settlement, she gets a second chance at love. Will another cowboy steal Jillian’s heart? When a Philadelphia real estate agent is deserted by a cowboy, she tries to flip a Texas horse ranch she got in her divorce settlement and gets a second chance at love. Will another cowboy steal Jillian’s heart? After Philadelphia real estate agent Jillian Marsh is deserted by a cowboy, she tries to flip a Texas horse ranch to pay for her daughter’s tuition. Jillian, her father, and daughter head to a tiny, tornado-torn town in Texas, never knowing the second chance at love it could bring. Will another cowboy steal Jillian’s heart? Many of my friends have suffered through the stigma of divorce, feeling like there’s a scarlet D seared on them for life. I was inspired to write this book to encourage women that there is life after divorce and the hope of second chances. “Don’t trust anyone…” So whispers Robin’s mother just moments before she dies. Uprooted from all she’s ever known, 17-year-old Robin Finley is sent to her mother’s old hometown to live with an uncle she’s never met. The town is small, but it shelters big secrets. Robin encounters two mysterious young men, a tragic mansion, and disturbing questions about the past. While unraveling the threads of her mother’s shrouded life, Robin meets more confusion. Her soul longs for peace and her heart yearns for love–yet she’s consumed by suspicion and fear. Why did her mother flee this town so many years ago and never return? Robin’s determination to discover the truth ensnares her in a tangled web that spans the years and threatens to destroy her future.